3 day Mtkheta - Ananuri – kazbegi Drive to Mtskheta - one of the oldest cities of the country of Georgia, was capital of the early Georgian kingdom of Iberia during the 3rd century BC - 5th century AD and it was the site of early Christian activity. Visit SvetitskhoveliCathedral (11th century) and Jvari Monastery (6th century) in Mtskheta are among the most significant monuments of Georgia architecture, and are historically significant in the development of medieval architecture throughout the Caucasus. Drive to Ananuri. Visit Ananuri (17th century) is a castle complex on the Aragvi River. Tour along hiostorical Georgian Military Road. 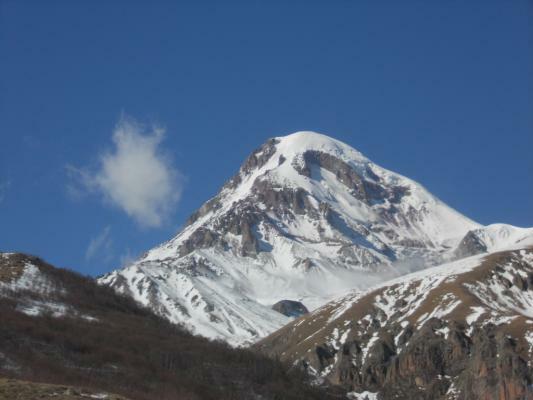 Continue the tour to kazbegi by crossing the “Jvari Pass” (2379 m. above the sea level) . Explore the area – the beautifully situated on the hill. Hire 4X4 vehicles to get to Gergeti Holy Trinity Church is a remarkable monument of Georgian architecture, near the village of Gergeti, situated at an elevation of 2170 meters, under Mount Kazbegi (elevation 5033). Drive to Gudauri - ski resort (2000 meters above the sea level) located on the southern slopes of The greater Caucasus Mountain Range in Georgia. Overnight at Gudauri. 5 day Borjomi- Vardzia-Khertvisi-Bakuriani Drive to Borjomi - is a resort town in south-central Georgia. The town is famous for its mineral water industry (which is presently the number one export of Georgia) Visit Borjomi Park. Mineral water tasting. Drive to Vardzia. Cave town Vardzia (XII century) is one of the most important and impressive historic monuments in Georgia. Vardzia is located at the altitude of 1300 meters above sea level. On the way back visit Khertvisi fotress – one of the oldest fortresses in Georgia and was functional throughout the Georgian feudal period. Drive back to Bakuriani. Overnight in Bakuriani. 6 day Kutaisi –Gelati-Bagrati Tour around Kutaisi. Second largest city of Georgia. Visit Gelati, Bagrati Gelati Academy and Monastery is a monastic complex near Kutaisi, the region of Imereti, western Georgia, was founded by King David IV the founder in XII century. During the 12-13th centuries Gelati was one of the biggest religious, educational, scientific and philosophy centers of Georgia. The founding of Gelati is tied to the cultural renaissance of Georgia. Bagrati Cathedral proudly watches over Kutaisi and the Rioni River. It was built in the early years of the 11th century, during the reign of King Bagrat III due to which it was called "Bagrati" Cathedral, i.e., Bagrat’s cathedral. In 1994, the Bagrati Cathedral, together with the Gelaty Monastery, was included in the UNESCO World heritage Site list as a single entity. Overnight in Kutaisi. 7 day Kutaisi- Batumi Visit Sataplia Cave - famous for fine speleothems and the dinosaur footprints nearby. The tour enters the through-cave on one hillside, crosses the hill underground and then goes back on the surface past the dinosaur footprints. Drive to Batumi Overnight in Batumi. 8 day Batumi Botanical Garden –Gonio-Batumi Batumi is a seaside city on the Black Sea coast in southwest Georgia. Batumi’s seaside park is one of the charms of the city. It stretches along the seashore to the north-west of Batumi like a green line. A wonderful view is spread in front of the spectator’s eyes as three successive fountains joyfully spew their loads while French dancing fountains shimmer in the new section of the seaside park. The park has five parallel alleys which are separated from each other by lawns, cafes and meticulously cut, square laurel bushes. The park also contains an Aqua Park. Batumi Botanical Garden has no analogue in the world as plants endemic to completely different climatic and landscape zones co-exist here side by side. The Garden contains thousands of plant species of astonishing beauty. Visitors are always particularly fascinated with the Gardens’ 1200 species of rose. Gonio Fortress is located 12 km south of Batumi on the left bank of the River Chorokhi, it is a real paradise for lovers of historical and cultural antiquities. Historically, Gonio-Apsaros Fortress had a unique strategic importance: It protected the entrance to the Chorokhi and Acharistskali gorges, which connected the south western inlands to the Black Sea littoral. It was this important location that made Gonio Fortress into one of the citadels of both the Roman and later Byzantine Empires. Free time in Batumi. Overnight in Batumi. 9 day Batumi-Tbilisi Drive to Tbilisi. Free time in Tbilisi Overnight in Tbilisi. 10 day Sighnaghi-Bodbe Drive to eastern part of Georgia- Kakheti region, known almost exclusively for its vineyards and wineries. VisitSighnaghi – one of the beautiful towns of the kakheti region. Sighnaghi and its environs are home to several historical and cultural monuments. The town is walled with the remnants of 18th century fortifications. At the elevation of about 790 m above sea level, the town overlooks the Alazani valley and faces the Greater Caucasus Mountains. Wine and Chacha tasting at the winery, with a very interesting and impressive stories about wine and wine making traditions. Drive to Bodbe – Georgian Orthodox monastic complex (9th century) Drive back to Tbilisi.